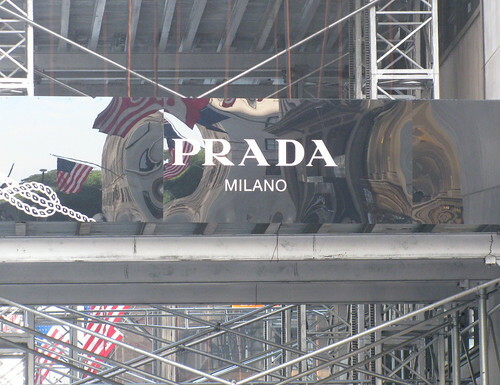 Slip into the Prada of Poems? So you want to be a sonneteer? To prove yourself mistress of wit and master of sass? To cultivate your inborn ability to think up, slap down, and grand slam fourteen-liners like it’s nobody’s business—and live to tell the tale? Call a sonnet anything, but don’t call it subtle. The sonnet’s aim is plain: to woo them and wow them, to take no prisoners, to claim and keep her readers’ hearts with nothing but big sound and a little sense. She’s a diva, and as with every soprano joke you’ve ever heard, what she wants is all of everyone’s attention. The sonnet is small, despite its big voice, and its diminutive size may make it seem fragile. But the sonnet is a shoe your feet would kill to fill, so why not?—try one on for size, walk the floor, dance a two-step, and see how it feels. My guess is that once you break it in, one sonnet won’t be enough—you’ll find yourself morphing into the Imelda Marcos of poets, the pages of your notebook lined with sonnets of every hue and make—Petrarchan, Shakespearian, Spenserian, Miltonic, Versace (okay, there’s no Versace Sonnet)—yet each of them bearing your signature stride and strut. As it turns out, I struggled to wear the sonnet, but it didn’t quite fit my feet. My younger daughter shared my pain, while my older daughter wooed and wowed us at high-speed, composing sonnets like they were some kind of oversized Lego-blocks project: so easy that any three year old could do it. While I think it’s important to discipline myself to try on the shoes of various poem forms, I understand that personality and brain-wiring somehow play a part. I may be sassy, but I’m no sonnet master, and I suspect I never will be. the ball, what gall muster towards, “I do”? coated slippers towards spondee minutes? Where we pace time’s seconds on silk shirred string. Post by L.L. Barkat. Visit L.L. at Seedlings in Stone, for more on writing, poetry, art and life. 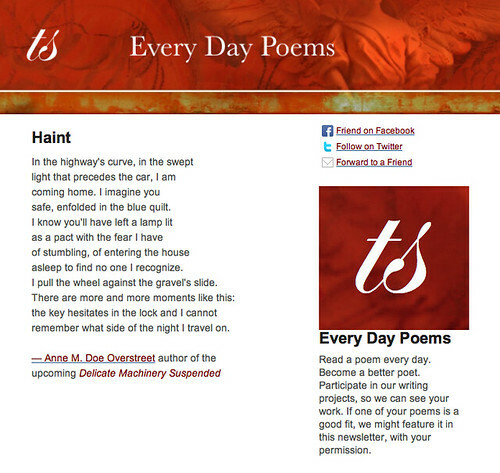 Subscribe to Every Day Poems— Read a poem a day, become a better poet. In August we’re exploring sonnets. Angela is a wonderful writer! Thank you for walking back those snippets. It’s been good practice to try to stuff a foot into a glass slipper sonnet and try to keep it from breaking stride or rushing off with another iamb that’s gotten a little too accented for its own good. I’m going to keep writing sonnets, even if I ruin a whole bunch of shoes. It’s good practice, as you say, and I find that I do more revisions (even weeks later) with sonnets. Not sure why. Maybe it’s that “small room” that just keeps calling my attention to things. Thanks, Laura, for posting the original intro to the Glass Slipper Sonnet piece (cheeky? moi? )–and thanks, Maureen, for reading & enjoying it. 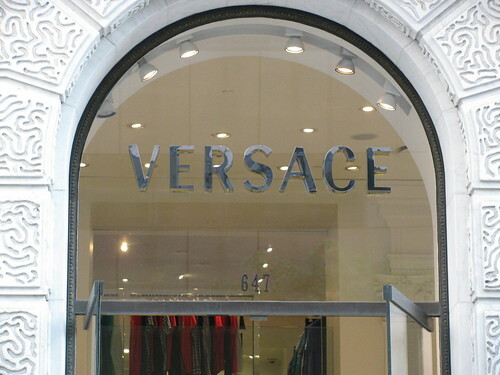 I love this “Versace” Sonnet, (a first!) with all of its rich internal rhyme (as well as unexpected end-rhymes), and the persistent, percussive alliteration (assonance and consonance, too!) that permits the poem to tap-dance across the floor (elegantly, of course). I keep reading (and re-reading) and find some new fun thing each time through. As Mr. Versace might say (were he still among us), Mille Grazie! And please do see Glynn’s new Italian Sonnet and his entirely original take on the tale. (The prince speak-eth!). Old shoes for new might net those two paired rare. Himself did cheers with purchase made and fast. Back valets then on drawing board placed thumbs. He Reeboks wore on hunt and camped convinced. Squeal! Love! I must try another. I like “I ams that jam” and “spondee minutes.” Clever!